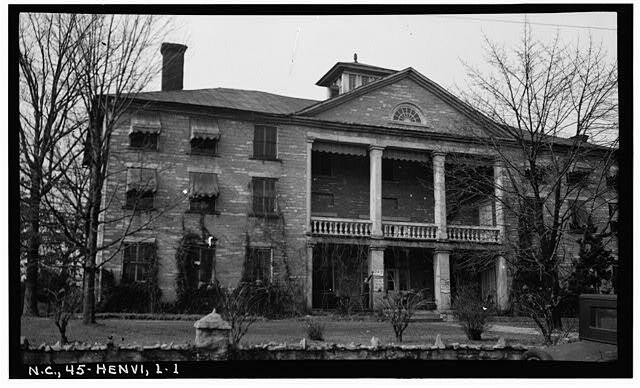 Judson College was a nineteenth-century academy located in the mountain town of Hendersonville. The school was conceived by the Western Carolina Baptist Association in 1858 and originally named the Western North Carolina Female College. Construction of the college's main building was begun in 1860 under the direction of a board of trustees that included the Reverend Nelson Bowen as president, Daniel King as treasurer, and A. T. Allen as secretary. The Civil War halted the building process, however, and the incomplete structure housed a variety of ventures until 1879, when a high school was opened on the site. The Judson College catalog for the academic year 1887-88 shows the curriculum to have included mathematics, English grammar, natural science, "language lessons," North Carolina history, geography, Latin, and Greek. A six-year "common school" course of study was available to students, preparing them for "entrance to high school or academic work." The Preparatory Department was a three-year course for individuals interested in attending the University of North Carolina or another college in the state. Finally, the Normal Department offered its graduates either a teaching certificate or a Bachelor of Divinity degree, depending on the length of the course. Tuition for these courses ranged during the 1890s from 24 cents to $1.00 per week; for students boarding at the school, an additional $2.50 per week was charged. While Judson College never established itself as an influential academy on a state level, it was an important part of its local educational environment. A number of the college's former students became leaders in Hendersonville and Henderson County, including V. L. Hyman, a mayor of Hendersonville; S. M. King and J. P. Fletcher, clerks of superior court; and F. M. Jordan, a member of the state's Department of Insurance. The school also produced many influential teachers and educational administrators before it was closed in 1899, a victim of two decades of financial struggles. J. T. Fain Jr., "'Old Judson' Is Coming Down," Hendersonville Times-News, 11 Aug. 1965. "Old Judson College Marker to Be Unveiled Today," Asheville Citizen-Times, 13 June 1954. "Historic American Buildings Survey, Stewart Rogers, Photographer February 20 1934 EAST ELEVATION (FRONT). - Judson College, Third Avenue & West Flemming Street, Hendersonville, Henderson County, NC." Photo courtesy of Library of Congress. Available from http://www.loc.gov/pictures/resource/hhh.nc0256.photos.102283p/ (accessed May 8, 2012).